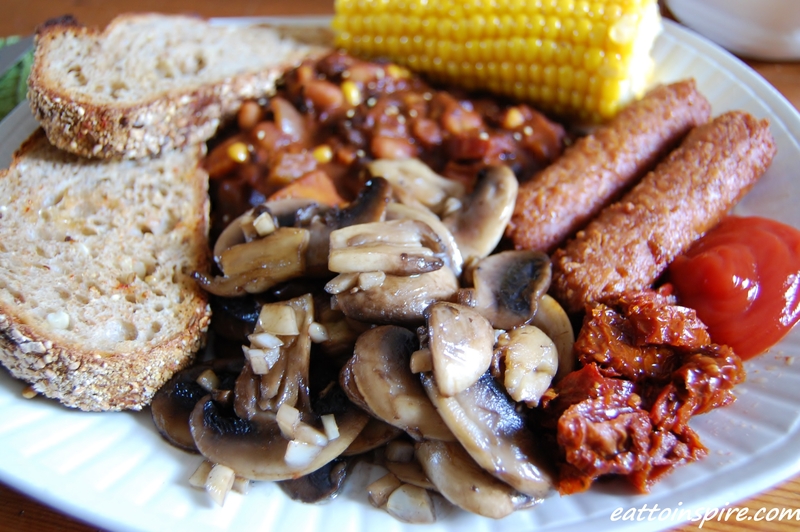 Tonight, day 4 of Vegan MoFo, I present to you Epic Mealtime: Vegan Hangover Edition. Yep, I am without doubt the biggest lightweight of them all. After not that much to drink last night I woke up this morning feeling pretty rough around the edges. My lovely house mate had coffee ready for when I woke up – amazing. After zero hair brushing and dressing in whatever I could find on the floor I dragged my sleepy head out to Mark’s Bakery. For those of you who don’t know Mark’s Bakery is a bloody amazing bakery in Bristol. They specialise in making bread which is the bomb. If you live in Brizzle you absolutely must go to Mark’s for a seven seed sourdough. You will not be disappointed. So I got my grubby little mitts on my sourdough, grabbed a packet of Linda McCartney’s vegan sausages and headed home to create my much needed feast. I certainly pushed the boat out for myself, a girl’s gotta treat herself 😉 It’s not like there was anybody else offering to take me out for breakfast.. This is by far the best breakfast I have had this year. It is super nice to make special meals just for yourself, it feels loving and nourishing. A lush treat that you don’t have to share. In case you are wondering.. WTF?! (Where’s the fruit?) I am planning some more healthy raw posts for next week. Watch this space! I hope you guys are all doing fantastic. I am loving all of the blog loving I am recieving from you guys, it is so sweet and really means a lot to me. I am really enjoying doing the Vegan MoFo and I am excited to think about new things to share with you guys. Is there anything you would like me to write about? Lol this is great. Kudos to you for your veganism – I could never do it. Can I come round for breakfast lol? 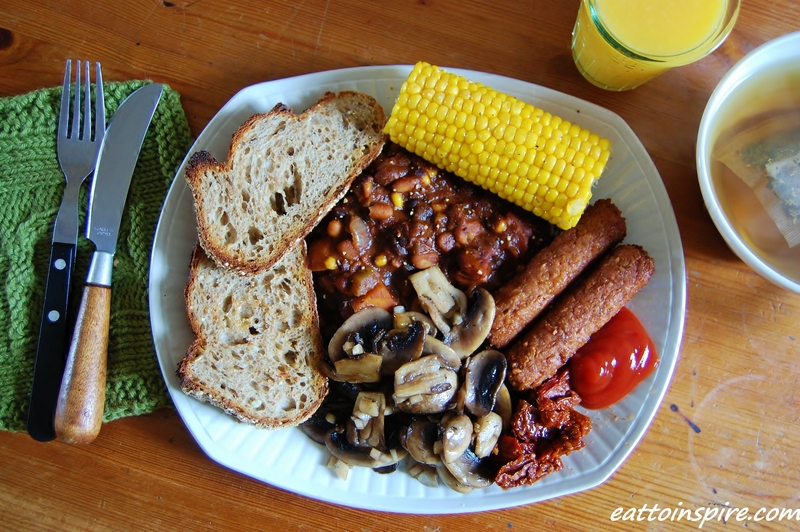 I am a big breakfast fan, never thought to add corn on the cob!! Mind blown! Did you make the smokey beans? looks delicious!